Enrich your early to late summer garden with the Deluxe Dutch Glads Bulbs Mixture to create a colour rainbow. This collection of stunning gladioli includes ravishing shades of red, pink, orange, white, purple and bicolours to grace your yard and provide cut flowers. Easy to grow, perennial gladiolus bulbs are hardy for zones 3 to 10 and require full sun to do their best. We recommend that you plant the bulbs in the spring, about 4 to 6 inches apart and 6 inches deep in loamy, sandy or clay soil. The flowers produced grow from 3 to 5 feet tall and spread between 12 and 18 inches. We also recommend that gardeners from zones 3 to 7 lift the bulbs in the autumn to store through the winter. Plant gladioli in a protected area such as against a wall, along a line of conifers, between shrubs or in other sheltered areas. Stake taller flowers to provide added strength. 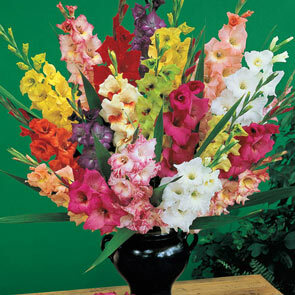 This gladiolus mix looks beautiful when grouped en masse, providing a riot of colours. Good companion plants include coneflowers, peonies, hosta and salvia, which complement the slender stalks of gladiolus. These charming blooms are also a favorite among gardeners for their long-lasting cut flowers. Enjoy the Deluxe Dutch Glads Bulbs Mixture for the colour and excitement it brings to your garden. Dutch glads are among the most popular summer flowers throughout Europe and America. Our superior-quality bulbs from Holland's leading growers produce stunning satiny blooms in vibrant colours. Magnificent for cut-flower bouquets and easy to grow, this professionally selected mixture is fully guaranteed. 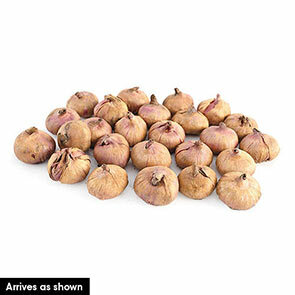 Plant bulbs 4-6" apart in a sunny location.Gladious.